She was born at 23w5d due to complications of preeclampsia on Jan 1st, 2009 and she weighed 15.6 ounces. On Day 25 of her life she was diagonosed with BPD - Bronchopulmonary Dysplasia. They started her on a 3 week Nitric Oxide treatment (which is a new treatment of which the results can only be determined with time..). She was in the NICU for 4 months and came home on May 4th on 1/4L of oxygen. Air Concentrator/Compressor or Oxygen Sender-Outer?? They sent us home with tanks and also an air concentrator. (I think that's what they call it) It's a box that plugs into the wall and pulls the air from your home in, separates the gases, and sends the oxygen through the tubes to D. It has about a 50 foot tube that makes it easier for us to move from room to room. We currently live in a basement apartment so I can walk from one end of the apartment to the other with no problems. It's kinda loud and puts out a TON of heat which isn't so fun in an apartment with no AC but we deal. Oxygen Tank - did you need a caption for that?? For days when we need to leave the house (ie: Dr's appointments or walks with the stroller so I can see the sunlight and not be a hermit...) we have an oxygen tank. They come in different sizes, the biggest being about 3 feet tall with wheels that you usually see old men wheeling around. We have the size smaller than that. It's about 2 feet tall but comes with a little bag that makes it easy to carry around. When we initially came home on 1/4L of oxygen, the tank would last maybe 8 hours? I can't remember very well and I don't have the chart to tell me. It wasn't long. Last week, when we had her on 1/16L 24/7, it lasted about 3 days. Our home medical supply company will bring out as many tanks as we need and we just need to give them about a days head start so they can deliver them. Foam strap with the leads velcroed underneath - Ignore her gymp-looking hand. I swear she was moving. Yes she still has a umbilical hernia. Yes it looks funny. :) No it doesn't require surgery... Yet. 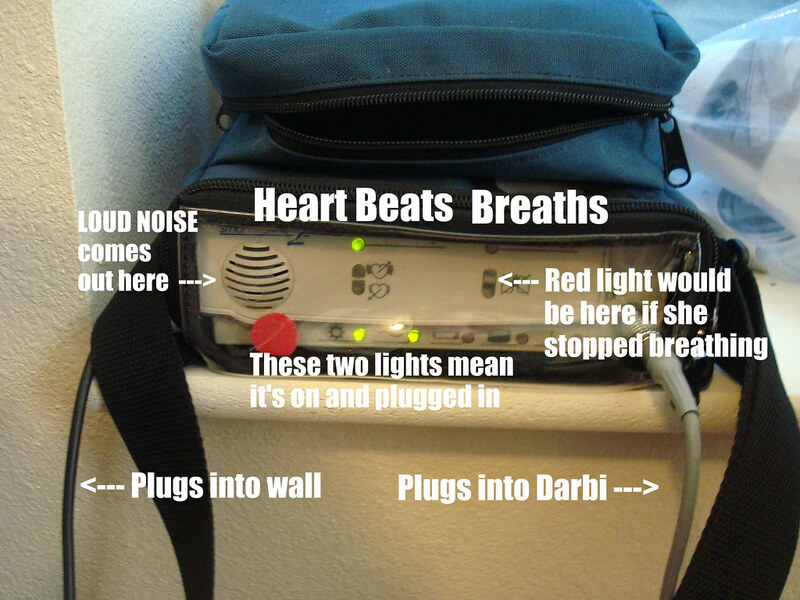 D is also on a heart monitor. She has the foam strap that goes around her chest and there are 2 leads; one under each arm. There are no numbers on the actual monitor, just lights. A little green light blinks for every breath she takes and another one for every time her heart beats. The breathing light doesn't seem to register every breath but if she goes longer than 20 seconds without breathing then the alarm with go off and a red light will stay lit under the appropriate blinking green light. So in case I'm out of the room of cannot see it when it goes off, I know why. And if her heart rate goes below 70 the alarm will sound. The alarm is LOUD. We have only had it go off in the middle of the night a few times and once because I forgot to plug it in and the battery died. We jump out of bed so fast! It's nerve racking but when I think if we hadn't had the heart monitor, what could have happened... then we are happy for that annoying little thing. WOW. So complicated! Kudos to you both for being such troopers... and I thought Connor's care was involved. We were pretty close to having to bring him home with at least a heart monitor - I count my blessings everyday that our biggest concerns are dr appts and meds. You guys are rock stars!